The priest shall do it! 13 'Now if the whole congregation of Israel commits error and the matter escapes the notice of the assembly, and they commit any of the things which the LORD has commanded not to be done, and they become guilty;14 when the sin which they have committed becomes known, then the assembly shall offer a bull of the herd for a sin offering and bring it before the tent of meeting. 15 'Then the elders of the congregation shall lay their hands on the head of the bull before the LORD, and the bull shall be slain before the LORD. 16 'Then the anointed priest is to bring some of the blood of the bull to the tent of meeting; 17 and the priest shall dip his finger in the blood and sprinkle it seven times before the LORD, in front of the veil. 18 'He shall put some of the blood on the horns of the altar which is before the LORD in the tent of meeting; and all the blood he shall pour out at the base of the altar of burnt offering which is at the doorway of the tent of meeting. 19 'He shall remove all its fat from it and offer it up in smoke on the altar. 20 'He shall also do with the bull just as he did with the bull of the sin offering; thus he shall do with it So the priest shall make atonement for them, and they will be forgiven. Sin creates a need. And I don’t speak about a need you feel with the one who has sinned, or has sin – like you experience the lack of nutrition as an obvious hunger feeling – but a real need. Some people can have an ocean of obvious sins and daily live and practice obvious sin, without having any annoying feeling of that matter, while others are so sensitive in this area that the most overshadow feeling in life is a guilt feeling. It’s not about what we sense and feel, and not either what we mean – our opinions, what we think is reasonable or unreasonable etc, but about what God has revealed in His word! Where there is sin – and all sin is sin against God – there is also a real need for forgiveness of sins! If a person is left standing without the forgiveness of sins – yes, then he is standing before God with sin, and has to take the consequences from it. And that means he is lost forever. So the real need we speak about here now is in other words pressing! You have to have that – and in time as well! God had given the Jews directions: For known sin it should be sacrificed in public, among others – to a testimony that God in His holiness demanded accountability for sin – and last but not least that there existed a sacrifice that could take away guilt! It wasn’t the bulls, the calves and other animals that were sacrificed on the earthly alter here, but the sacrifice they were a model for, and pointed towards: The perfect sacrifice, that which was of God. The sacrifice God Himself had chosen: The Lamb of God, Jesus Christ! We should notice something here: “Now if the whole congregation of Israel (inadvertently) (Norw. transl.) commits error…” (v.13a) . Now we know that God in His mercy – for His own sacrifice sake – leaves more than what has happened of error, He also leaves transgression, it says. Transgression is a sin a man has committed despite that he in advance knew it was a sin. But still from this passage we should be aware of that God in His holiness is a consuming fire also against the sin that has happened in error (inadvertently). As we see here – it has to be sacrificed for! We think so quickly about this – yes but, I didn’t mean it like that, so it isn’t that serious! Let God’s word answer to that now: “Without shedding of blood there is no forgiveness.” (Hebr.9:22). The sin you have committed by error – only a word that shouldn’t have been said for example – it has to be made atonement for! Or else you are left standing before God with it! It will not be forgiven! Then I can ask: Is your need for forgiveness of sins a real need? There shouldn’t be any reason that it would be blurry to you, if you look for it in God’s word. But that is what so often is so tragic – people don’t look after God’s word, but consider themselves: What do I think is fair? God will never ask you what you think is fair! What did you do with the Word you heard – or more precise: What did it do with you? Now we should notice something more in this passage – and that is a delight. It is a relief for the soul, where it is sick and wounded, exactly because of the importance we are standing before: “So the priest shall make atonement for them, and they will be forgiven.” (V.20b). When the priest did this after the laws God had ordered him, the people got forgiveness of sins! They just stood there and watched what the priest did. In that they had salvation! They could not do anything themselves here – even if they had given their bodies to be burned. It was somebody else – the priest – who had to do something, and he again had to do it perfect in regulations to God’s directions. We will again let God’s word answer that – anything else is not interesting in this context: “- how much more will the blood of Christ, who through the eternal Spirit offered Himself without blemish to God, cleanse your conscience from dead works to serve the living God?” (Hebr.9:14). And we know the words from 1 John: “- and He Himself is the propitiation for our sins; and not for ours only, but also for those of the whole world.” (1 John 2:2). We hear about what the priest did for the people! Listen again to what is testified about this sacrifice here in Leviticus: “So the priest shall make atonement for them, and they will be forgiven.” (v.20b). They were given forgiveness! Who? How many? Then we get a wonderful answer: “Now if the whole congregation of Israel commits error…” (v.13a). This sacrifice took away the sin and the guilt that laid upon all the people! Therefore the angel preaches the Christmas night: “Do not be afraid; for behold, I bring you good news of great joy which will be for all the people.” (Luke 2:10). He had come to make atonement and take away all the sins of the world! Who is it then that don’t have a reason to be happy? You can leave right now and say: I don’t want this! I want to go my own way! Most people do that, Jesus says – choose the broad way to perdition. But you can’t say that God hasn’t made atonement for you too! Lift your eyes a little and see what is going on inside the Holy of Holies. God Himself has pulled the veil aside for that: The priest – the high priest Jesus – carries His own perfection according with God’s holy demand and laws, and the people – you – get the forgiveness of sins! But of this reason alone! 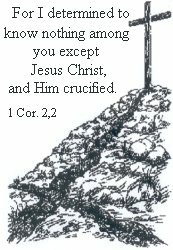 Didn’t Jesus speak the truth when He shouted from the wooden cross: “It is finished?” That is the question you have to take very seriously! Because if it is true, what He testified, then there should be absolutely nothing that you should add to it! And if that’s what you’re doing – adding to it – you must by all means call it seriousness or god fear or whatever a man can come up with – it has to have its reason that you don’t believe in Jesus words! And what does He say about Himself? He says: “I am the truth!” (John 14:6). He is the one who testifies for your heart right now, as you hear His word again: “It is finished!” The priest has made atonement for you! Many priests in the Norwegian church, stands and mumbles themselves further and further into spiritual darkness that lowers itself over land and people in this time, but the true light that lights up every man (John 1:7, He shines still in darkness and His light is a light to salvation. So listen: “So the priest shall make atonement for them, and they will be forgiven.” (v.20b).